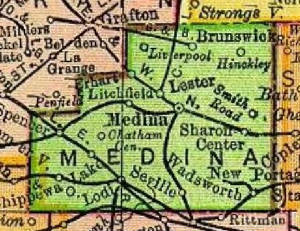 MEDINA COUNTY was formed February 18, 1812, "from that part of the Reserve west of the 11th range, south of the numbers 5, and east of the 20th range, and attached to Portage county until organized." It was organized in April, 1818.The county was settled principally from Connecticut, though within the last few years there has been a considerable accession of Germans. The surface is generally rolling, with much bottom land of easy tillage; the soil is principally clay and gravelly loam—the clayey portion scantily watered, the gravelly abundantly. The soil is better adapted to grass than grain. The first trail made through the county north, toward the lake, was from Wooster, a short time after the declaration of war with Great Britain. The party consisted of George POE (son of Adam, the Indian fighter), Joseph H. LARWILL (a famous surveyor of Wayne county), and Roswell M. MASON. We Can Provide Service and Repairs That MAY BE COVERED Under Your Home Owners InsuranceFor Damage Caused By Wildlife.